AlHaj is touring the United States in support of the resulting album, "Letters from Iraq," which is set to be officially released next month on the Smithsonian Folkways label. 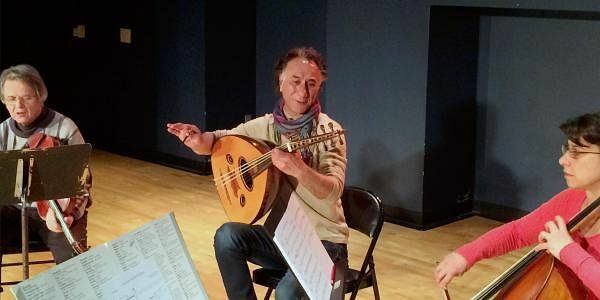 DEARBORN (MICHIGAN): Rahim AlHaj cried every time he read the letters of eight Iraqis sharing personal, harrowing tales of love, loss and hope in wartime since the 2003 U.S.-led invasion. Rather than retreat, the Iraqi-American composer and musician immersed himself in the stories and emerged with a collection of songs to illustrate them. "I felt obligated to make these stories," he told The Associated Press during a phone interview from the Detroit suburb of Dearborn, where he will perform Friday at the Arab American National Museum. "It has to be heard — it has to be seen. ... This is what the Iraqi people went through during that time period." For AlHaj, who plays a stringed instrument with ancient Iraqi roots called the oud, the tears still fall when he recounts the stories behind the music. One is about a teenage boy who was returning home when a car bomb exploded and leveled his home, sending his homing pigeons skyward with nowhere to land and destroying the alibi that allowed him to see his girlfriend while he cared for his birds and she hung laundry. Another is of a man who returns to Baghdad after living in exile — and finding a place that no longer feels like home. Then, there is the letter written by AlHaj's nephew, Fuad, who inspired and encouraged the musical project. Then a teenager, Fuad was getting a haircut at a barbershop when a bomb went off nearby and militants opened fire. Fuad, who could not run because his legs never fully developed, detailed the horror and carnage around him. He ends by writing, paradoxically, what a beautiful day it had been. AlHaj said Fuad led him to his friend Riyadh, the teen with the pigeons. From there, the composer collected more correspondences while visiting his homeland, and realized he had to share these stories that might otherwise never be heard by the larger world. AlHaj said he initially envisioned reading the letters in lectures, but felt they deserved a broader audience and a more lasting, artistic treatment. He began writing instrumental music for the oud, violin, viola, cello, bass and percussion that "translates" the tales, he said. "It's really challenging because it's abstract — it's not words — but people understand it," AlHaj said. He added that the songs brought many people to tears at a recent Seattle performance, including a woman who approached him afterward. "She took her shawl and put it around my neck," he said. "She gave me a hug and said, 'Thank you for healing me.'" AlHaj graduated from Baghdad's prestigious and competitive Conservatory of Music, but was later imprisoned after refusing to join Saddam Hussein's Ba'ath party and supporting his regime. He fled in 1991 and eventually made his way to Albuquerque, New Mexico, where he now lives, and became a U.S. citizen in 2008. He has since performed across the globe, released nine albums and received two Grammy nominations along with other awards and fellowships. Still, he said, it was important for his story and accomplishments to take a backseat with "Letters from Iraq." "Musicians have ridiculous egos," he said, laughing. "I put my ego aside to just breathe and cry with these letters. ... I didn't want to show my virtuosity — I didn't give a damn about that. It's about supporting the voices of those letters."